Oriental and Persian rugs come from a variety of countries and areas of the world, each having its own story on how the art of weaving originated there, as well as how it evolved over the years and, at times, centuries. Some countries have a rug-making history so deeply ingrained in the culture that it has become synonymous with the people themselves, ultimately defining singular events, time periods, and even the long-cherished beliefs of many generations. 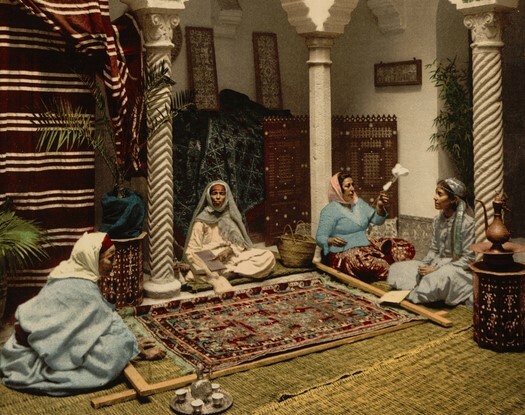 Today, Ahdoot offers a brief account of these countries, areas, and people and their relationship with the art of carpet-weaving. Chinese rugs, much like other rugs in Asian and European areas, have been produced for centuries. Many of the antique carpets can be identified by their design; for example, these carpets’ designs typically focus on the ruling emperor when they were being made, usually featuring symbols of an individual monarch, or the emblems representing a particular dynasty. While these pieces were hand-woven for centuries, it has only been in the last several decades that Chinese manufacturers have begun using machinery to produce their rugs, largely to appease the number of Westerners who have sought to display them in their homes. The country of India is the largest producer and exporter of Oriental rugs in the world, with the practice likely beginning with the country’s defeat by Persian conquerors. Over the years it has become well-known for the diversity of its design work, perfectly executing both traditional and modern creations. Much like Chinese rugs, Indian rugs have been making a strong transition to machine manufacture, which has lessened the quality of some of the rugs being produced in the country. However, there are still a large number of single artisans and shops hand-weaving these carpets for sale to local collectors and those searching for them abroad. Though rugs have been produced around the world for centuries, this area of the world is well-known as one of the birthplaces of carpet-weaving, and certainly the place where Persian rugs originated. What began as a practice designed to protect nomads and tribesmen from the harsh Persian (Iranian) climate, evolved into an art that launched a movement spanning both countries and continents. While Persian rug manufacturing has slowed somewhat recently, largely due to political and social unrest, the rugs already in circulation around the world exhibit some of the most high-quality weaving, dyes and threads available. The most notable rugs from this country today are the Tabriz and Kerman, though there are many other cities and towns which have produced, and still continue to produce, these expertly-crafted carpets. Pakistani and Afghan rugs are famous for their suppleness and delicateness, much of this being attributed to the extensive hand-washing process these carpets undergo, as well as the types of knotting being utilized. As with rugs produced in Iran, these are often considered Persian rugs, demonstrating many of the same qualities of superior workmanship and threads used during their manufacture. Rug production in these countries has slowed somewhat in recent years, with many of the rugs being made with the Western market in mind, rather than strictly displaying the tribal emblems and designs of their past. One benefit, however, is that these countries still consider the art of carpet-weaving to be sacred, with very few of those producing Persian rugs in this area having moved toward machine-made production. Turkey was once considered one of the leading exporters and producers of handmade Persian rugs, yet it has seen somewhat of a decline in the last few decades, with many manufacturers beginning to assemble the rugs through automated machinery. The practice was likely first introduced to the area by nomadic tribes in the first millennium CE, having a long and storied history in the region. Though there are some areas still creating high-quality Turkish silk rugs, they tend to be fewer and further between; yet, the country’s antique rugs still stand out as some of the best in history, often featuring tribal elements woven among the premium wool weft threads. Yet, no matter where your rug originated, one fact remains: Oriental and Persian rugs, both old and new, are some of the most stunning and captivating pieces of handmade artistry in the world. That's why Ahdoot wants to help you keep your rug in top condition, offering our specialized repair services and cleaning services to ensure it maintains its appearance for years to come. Are you considering adding a new rug to your collection, or purchasing your very first carpet? Be sure to view our gallery for most of the articles Ahdoot has to offer.